kt literary » Blog Archive » Happy Book Birthday QUEST TO THE UNCHARTED LANDS! Happy Book Birthday QUEST TO THE UNCHARTED LANDS! Happy Book Birthday and Congratulations to New York Times bestselling author Jaleigh Johnson on today’s release of THE QUEST TO THE UNCHARTED LANDS! Missing out on the excitement is one thing, but Stella is devastated at the thought of her parents flying into the unknown. So she takes matters into her own hands. Instead of staying with family as planned, she steals away and—right before takeoff—sneaks aboard the airship. But Stella isn’t the only stowaway. In the cargo bay is a boy who is also desperate to get to the Uncharted Lands. 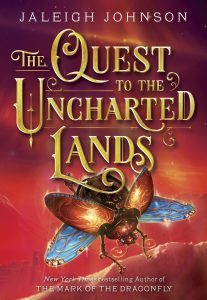 And someone else who’s determined to keep the ship from making it there at all. . . .
← Kirkus reviews THE QUEST TO THE UNCHARTED LANDS!